I’m soon about to move in with Melissa and start our lives together in Sacramento, CA. On my last visit to the states, I left all of my DSLR cameras at her place. I realized since I don’t have any cameras left in Sweden, I had to use my Celestron NexImage webcamera, but of course it’s not compatible with Windows 10! After spending almost an entire morning trying to install Windows XP Home edition through Hyper V Manager and also trying to install all the old Windows XP drivers from the Celestron’s CD I finally succeeded to get the webcamera functioning. 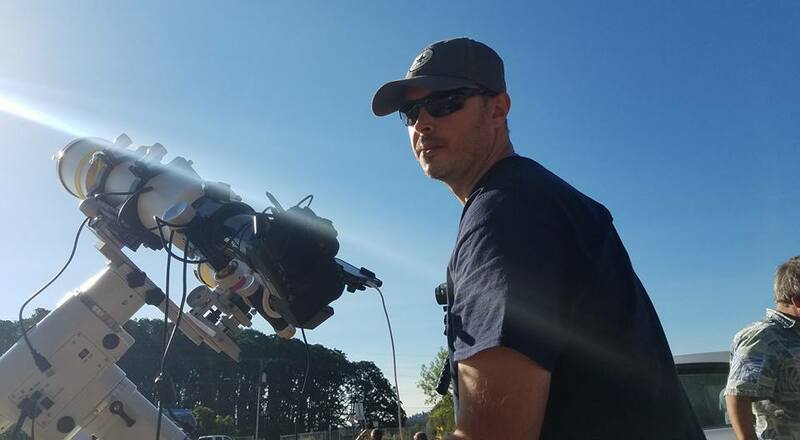 My idea was to broadcast live stream and share that with others, but I found myself abandoning that idea quite soon due to connectivity issues and also due to the camera not being setup properly. To my disappointment, I was running out of time and had to cancel my effort in trying to bring the webcam alive. The event would start at 1:15 PM local hour so instead I captured the event through the afocal-projection method by pointing my Windows cell phone (a Nokia Lumia 1020) against the ocular and to my surprise the phone captured a semi-good photo and a video of the event! 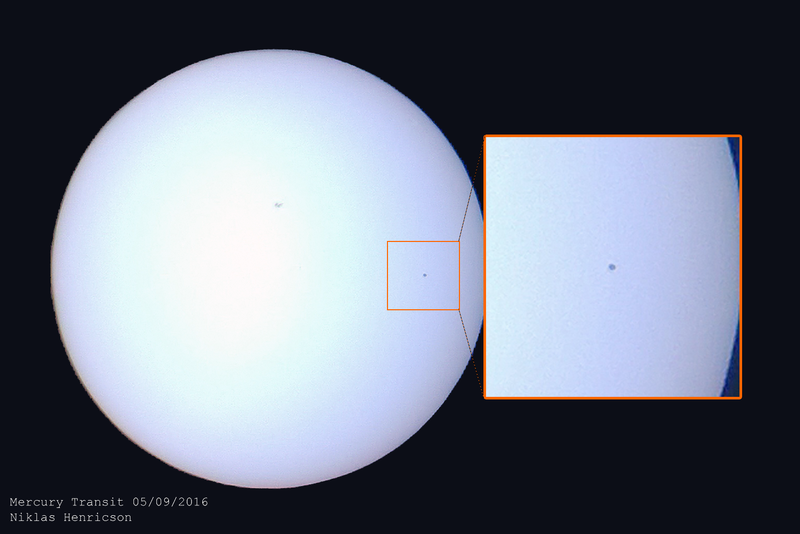 The next visible Mercury transit will occur in 2019 but will not be as spectacular as this one (so called a great transit). The next great transit will be again the 9th of Noveber in 2052. By the time I’ll be 73 years old and hopefully will be able to see it again! Another interesting fact about Mercury as a planet is its orbit around our sun. Not before Einstein came around with his general theory of relativity, could we explain the eccentricity of Mercury’s orbit due to the large bending of space-time fabric around the planet. Before that, Newtonian physics could explain halfway all the visible observations, which annoyed the scientists. Once again, Einstein could nail the answers to this odd behavior of the planet. Here’s a Youtube video of the event as well, expand the video to full screen in order to see the round dot on the right side of the solar disc. Mercury is a tiny planet and covers a mere 1/158 of the sun’s diameter. Enjoy watching! 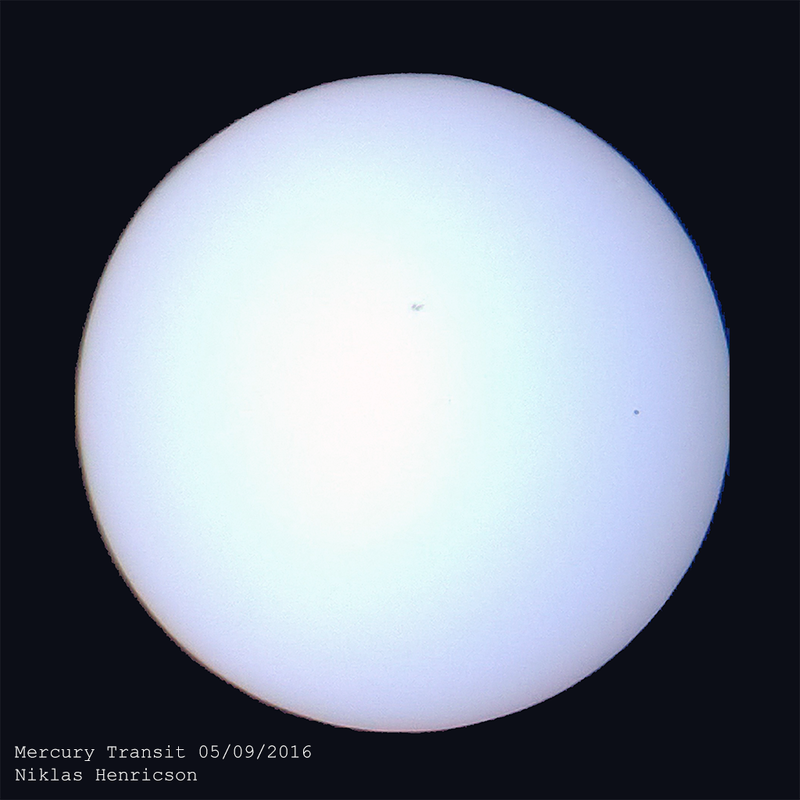 This entry was posted in Astrophotography, Observation and tagged 2016, Astrophotography, Megrez 72 FD APO, Mercury Transit, Niklas Henricson, Nokia Lumia 1020, Planets, William Options. New evidence of the impact of the recent planet-encompassing dust storm on water in the atmosphere, and a surprising lack of methane, are among the scientific highlights of the ExoMars Trace Gas Orbiter’s first year in orbit. When we think of climate change, one of the first things to come to mind is melting polar ice. However, ice loss isn’t just restricted to the polar regions. According to research published today, glaciers around the world have lost well over 9000 gigatonnes (nine trillion tonnes) of ice since 1961, raising sea level by 27 mm.